Belmont Cragin residents are eager to see better biking infrastructure in their neighborhood. 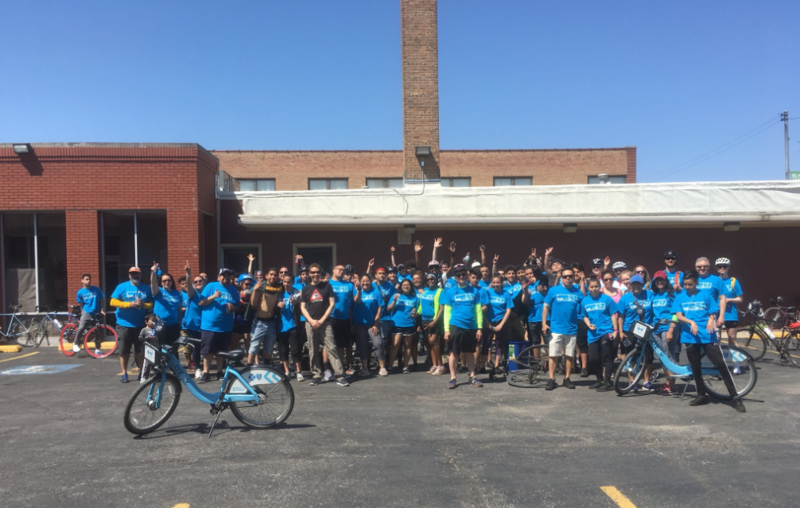 This desire was clearly on display on a recent weekend when 80 people came out to the Bike 4 Belmont Cragin ride organized by the Northwest Side Housing Center (NWSHC) and Active Trans. In addition to offering the ride as a fun local event, the ride was intended to demostrate community support for biking infrastructure and the need for maintaining existing bike lanes on the Northwest Side of Chicago. Some the participants kept the momentum going with a visit to their alderman to discuss ways to make biking safer in the ward. The route covered quiet neighborhood streets such as Wrightwood Ave., as well as busy arterial streets such as Grand Ave. Riders were able to compare the experiences of riding on streets with buffered bike lanes versus streets with shared bike markings, often called “sharrows,” which do nothing to designate space on the road for people biking and people driving. The momentum for this ride came out of the Belmont Cragin Quality of Life Plan, facilitated by the NWSHC. The Quality of Life Plan identified biking, walking and transit as key components. The Northwest Side of Chicago is still lacking an interconnected network of bike facilities that would encourage people to opt for getting around by bike. With more high quality biking infrastructure, people are more likely to make healthier choices for recreation and transportation, thereby improving their quality of life. Unfortunately, many of the bike facilities that do exist often are not maintained for people biking to feel safe. This past week, constituents of the 31st ward (where most of the ride took place), Active Trans members and supporters, Northwest side community representative of the Mayor’s Bicycle Advisory Council Joe Sislow, and staff and community members of NWSHC met with Alderman Milly Santiago of the 31st ward. The alderman was pleased to hear about the community support for more biking infrastructure and said that public safety for all was her top priority. We couldn’t agree more! NWSHC and Active Trans will work with the alderman’s office and potentially the Chicago Department of Transportation to host a community meeting where everyone can submit their ideas for how to make the 31st Ward safer for people riding bikes. To get involved, you can still sign our petition in support of the requests below, sign up for our advocacy supporters list to stay up to date on our advocacy efforts in Belmont Cragin and the rest of the city, and email julia@activetrans.org with any interest in organizing future aldermanic meetings in your ward. Crosstown routes such as Diversey Ave. and Grand Ave. Neighborhood Bike Routes such as Narragansett Ave., Long Ave., Wrightwood Ave., Melvina Ave., and Kilbourn Ave.
Stay tuned for further information on a community meeting to make the 31st Ward and Belmont Cragin community area a safer place for people biking.